DODS may be asked to give one example of Act formulation i.e. From identification of the policy issue, its examination, consultation with stakeholders, objection raised during examination in House of Lords and House of Commons etc so that the participants may have very good idea & information about the process followed in UK and what is the level of examination of any bill. 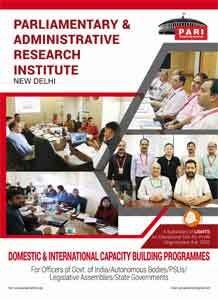 I was one of the fortunate participants who got an opportunity to attend second Joint International Training Programme (New Delhi + London) on Public Policy Management in Parliamentary Democracy organized by Parliamentary & Administrative Research Institute, India and DODS, London during 20-30 November, 2018. 1. Parliament Questions: Vey informative and Knowledgeable.